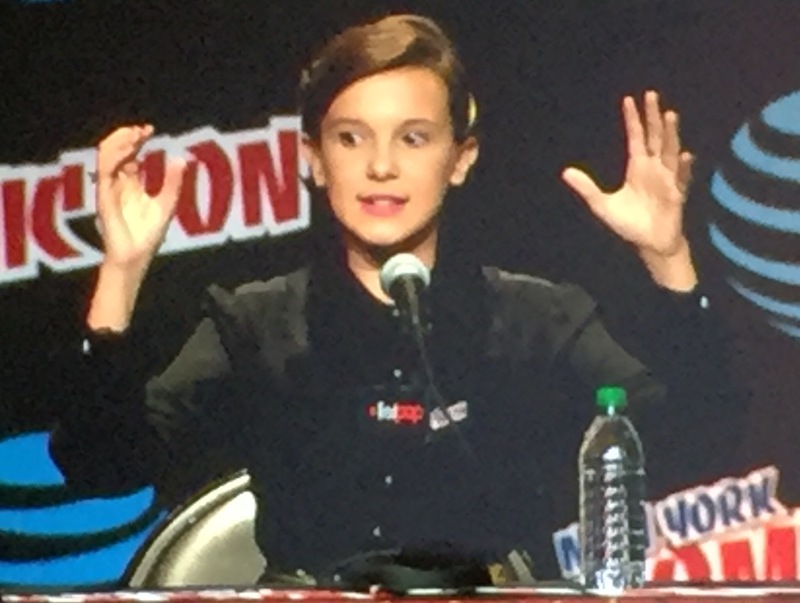 If you need proof that everyone and their mother is into the Netflix original series Stranger Things, then all you needed was to be at New York Comic Con’s Main Stage 1-D on Friday morning. Despite it being the first panel of the day, it was an overflow crowd in the largest panel room at the Javits Center. 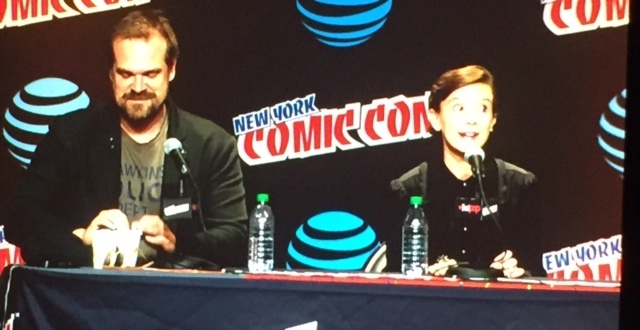 There were only two guests at the panel, Millie Bobby Brown (Eleven) and David Harbour (Hopper). Not that the crowd minded. Each received a standing ovation. The moderator led them through a conversation behind the scenes of making season one of the hit Netflix original series. David Harbour wore a hat to his audition. “I never do that,” he said. “But I thought this is a guy who likes to hide. The casting director said, “Hey man, do you want one without the hat?” And I said, “No, I’m good.” Obviously the hat worked. 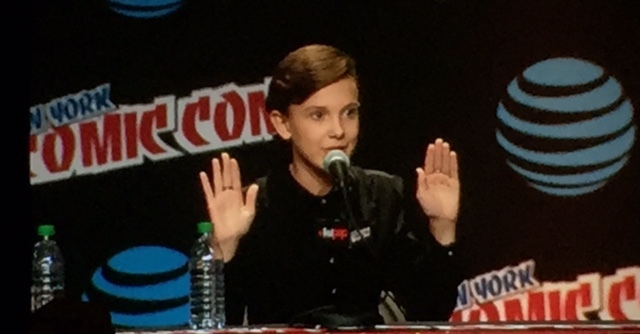 In regards to finding the character of Eleven, Millie said, “When we were on set, I was like, I don’t know what to do, and then I was like, “I know what to do to break someone’s neck!” And Matt said “Never say that out loud again.” Good advice. 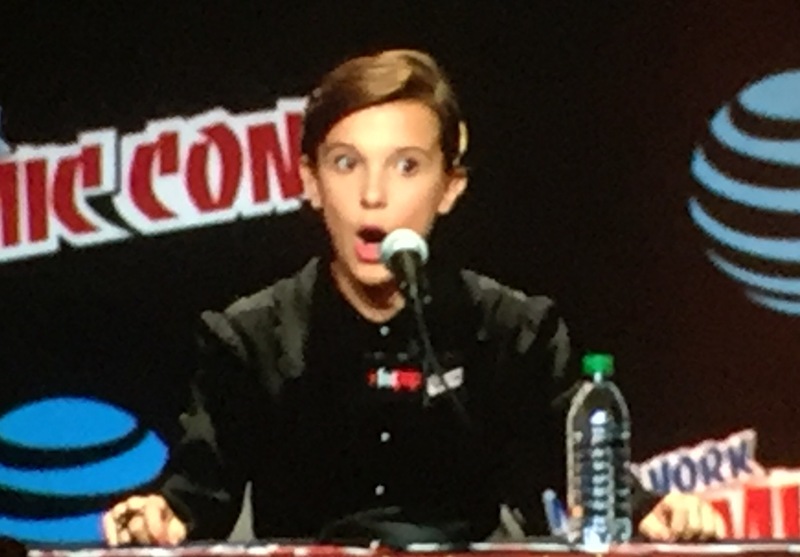 Out of all the scenes, Millie said, “The bathtub scene was hard. I was like, “There’s a lot of salt in here.” But the most difficult shooting experience was with the Demogorgon. 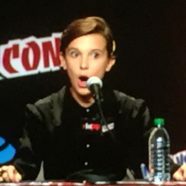 The suit that the actor wears who plays the Demogorgon is very thick. Because the suit was so thick, he couldn’t hear or feel anything. When Millie had a scene with him where she had to touch him on the back, he couldn’t feel her touch. The Duffers yelled at him to react, but he couldn’t hear him. Millie said something to him to get him to react and nothing, because he couldn’t even hear her. Eventually, they had to have someone kneel next to him and pinch his feet when it was time for him to turn. Someone asked if the Stranger Things set was near The Walking Dead set. It turns out Millie is a HUGE Walking Dead fan. “I would have died if I was anywhere near the walking dead people,” she commented. David and Millie have a great give and take relationship with each other. 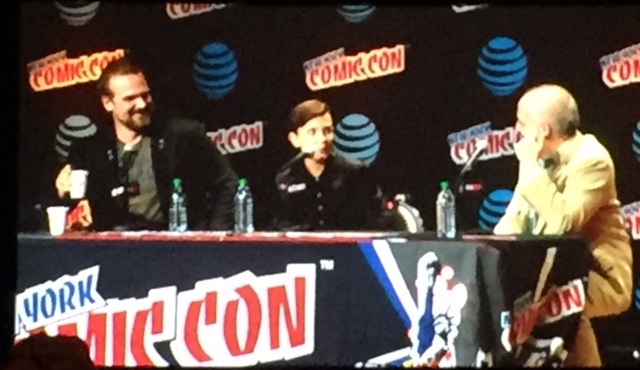 This panel was a complete treat for any fans of Stranger Things lucky enough to get in the room.